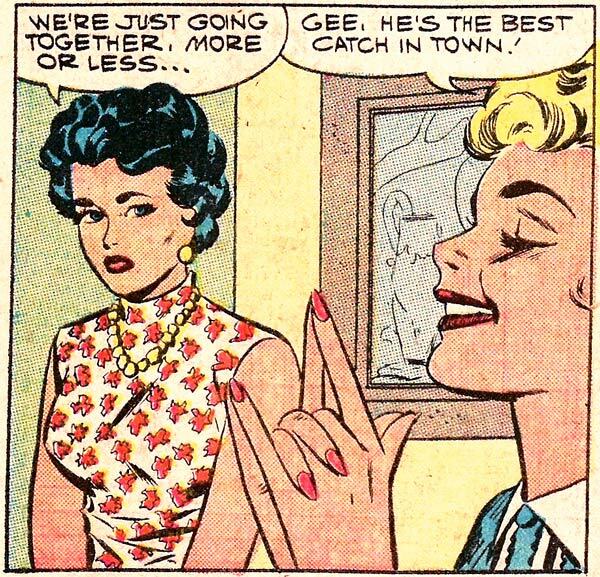 Art by Vince Colletta Studio from First Kiss #7, 1959. Men are like fish. Some are good catches—the kind you want to take home and mount…on your wall or whatever. And others are scaly, slimy, smelly mistakes–undersized and sorta icky. Those are the ones you just want to throw back into the lake—after they pay for dinner, of course. See this art revamped and with new, funny dialogue in today’s Last Kiss Comic.